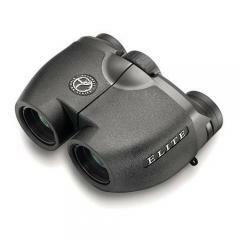 Bushnell 620726 Elite 7x26 Custom Compact Porro Prism Binoculars 620726 FREE SHIPPING! These compact Bushnell Elite 7x26 binoculars provide exceptional optical performance, and are equipped with some of the company's most advanced technology. Their fully multi-coated optics and BaK-4 Porro prisms provide a bright, sharp image, and its user-friendly center focus provides rapid adjustments for quick target tracking. The external lens surfaces also feature a Rainguard HD hydrophobic coating that breaks up water droplets, reducing light scattering in wet conditions. The lightweight magnesium body comes with rubber armor that resists impacts. Its textured surface also makes it easy to grip, even with wet hands. ©2002-2019 CopsPlus.com: Bushnell 620726 Elite 7x26 Custom Compact Porro Prism Binoculars 620726 FREE SHIPPING!